As part of the development strategy, we are happy to share and discuss our future plans with the community. This time, we are on a mission to provide a competitive War of Emperium server for our players. We came up with a variety of modifications, systems, and bonuses while taking into consideration the community as a whole. You can find our initial plan on our WoE system below. If you have any questions or feedback regarding the system, feel free to discuss and post on this topic. We thank you in advance for your comments, and hopefully, together, we'll be able to make a healthy War of Emperium competitions. The Vanilla WoE System aimed to assist new guilds to participate in War of Emperium as early as possible. Player will only need a 2nd Job (very fast to level due to EXP Boost for Pre-Trans Class) and Zeny to get them ready for the WoE. This system is completely automated and does not require any specific sign-ups or waiting lines. 1 hour before Vanilla War of Emperium starts (Every Thursday 9pm - 11pm), our Vanilla War of Emperium Shop will allow you to purchase rental equipment for a very low Zeny cost. The rental equipment is character bound items that only work on War of Emperium castles. You can enjoy your equipment until War of Emperium is over, then it will be automatically deleted. Just like other WoE, these skills are disabled. 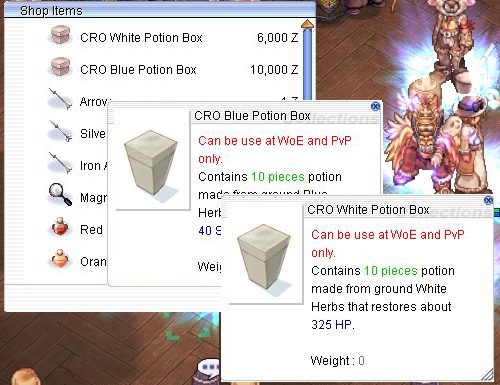 These are consumables that will not work at Vanilla WoE. Subject to change without notice. I have +10 Double Bloody Double Boned Composite Bow. Can I use it? NO you can't, you can only use weapon, armors and card purchase from Vanilla WoE Shop. Just be patient we might update with the higher refine as we go along. Can I use the rental equipments to farm and train? NO you can't. It will automatically un-equip when you enter fields and dungeons. Do we still get WoE Participation Reward? Can I use Costume Headgears? YES, you can. Only Costume Headgear with no attached stats may be worn. Can I invite Trans Class in my guild? YES, you can but they will not be able to enter the WoE castle. All trans class buff like Soul Link will be removed upon entry on the castle.